Users can easily work together to solve process performance issues, share their work and make use of findings at other sites. Depending on your deployment, Business Intelligence dashboards can be set up for a production line, a site or your entire business unit showing energy consumption, production waste, product quality or heat maps based on early warnings. Data from external sources can easily be imported and combined with historian measurement points for analytics. Examples include the use of product quality or financials. TrendMiner also provides an easy interface to export data for further use in data modeling tools or in MS Excel. TrendMiner provides various reporting options: embed a view in a report, print a relevant chart, create reports of notifications captured during production, trigger a shift handover report or download periodic loss accounting reports. All these options can be tailored to your organizational needs. 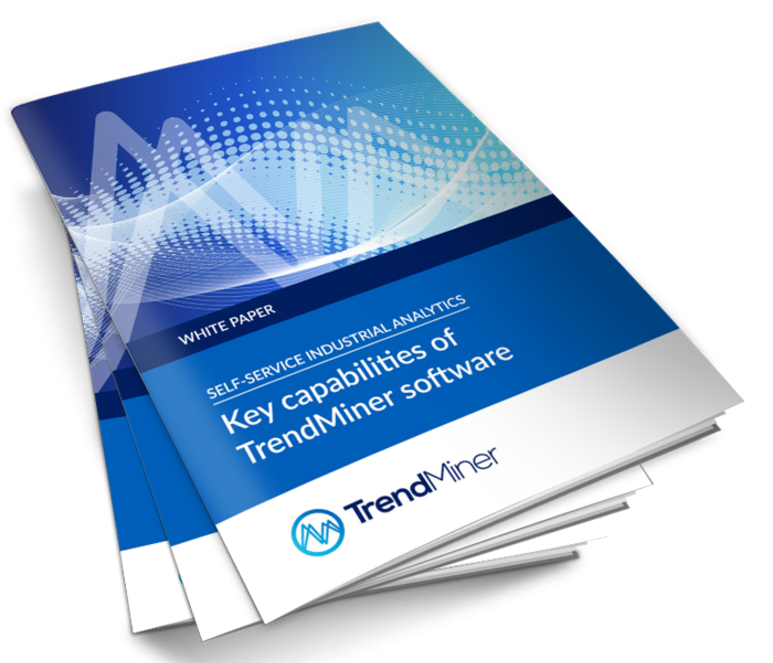 TrendMiner includes an asset framework and the ability to synchronize with external asset frameworks. Measurements and context data can be linked to plants, zones, units, equipment or sensors, to take into account logical or physical structures of the production facility. TrendMiner provides an easy, effective way to search through big production data and analyze the results yourself. It indexes all data from the historian, so results are available instantly, and provides multiple ways to search for interesting or abnormal patterns, relevant events or time frames within historical process or asset data. Click and search like you are used to in a google search box and modern apps. While typing your search term TrendMiner autofills best matching items, to speed up your analysis work. Visualize months of process data instantaneously. Filter and overlay data with the click of a button. From the selected time frame, a portion of the shown pattern can be highlighted. The intensity of the highlight acts as a priority setting for finding similar behavior in the total history of stored data. To learn if similar behavior has happened before, TrendMiner uses patent-pending pattern recognition technology. Pattern recognition helps to quickly find similarities, based on mathematical conditions, operating zones, equipment or process state changes, annotated event frames, etc. Periods of time can be easily overlaid to compare patterns and understand how they are different. TrendMiner uses its patent-pending pattern recognition technology to instantly find similar looking patterns over multiple years of process behavior. This helps to rapidly find out why a recent batch run deviates from the golden batch, or what is different in the way your plant is operating recently. With TrendMiner, users are presented with early indicators for anomalies of interest. These indicators are easily converted into early warnings. In this way, the process can be proactively adjusted to avoid waste and ensure product quality. TrendMiner allows users to create their own calculated time series with us of formulas, including moving window operators, Boolean operators, measurement shifts, etc. Calculated series can be used for search, diagnostics, monitoring and predictive purposes like any other measurement in the system. Tags can be shifted to compensate for process delays. Sometimes the root cause of specific process behavior is hours up stream. TrendMiner provides “automatic shift detection” features to find the most likely influence factor – even if that took place long before the tag was impacted. With TrendMiner, it is straightforward to bookmark behaviors of interest and capture the root cause. Users can associate metadata of interest with each labeled event, including custom fields, attachments and comment threads. Production losses or periods of high energy consumption can be detected with use of TrendMiner and listed automatically. After annotating the periods of interest with their causes, daily/weekly/monthly reports can be created for the analysis and classification of production losses. TrendMiner helps to prevent repeated production issues by guarding your live data like a watchdog. It monitors your live processes 24/7 and sends you automatic notifications in the event of deviations, based on predefined fingerprints. These early warnings on process behavior help to improve plant output with optimum energy consumption and reduction of waste, while complying with safety, health and environmental regulations. With TrendMiner you can easily identify the best process behavior based on optimum performance in the past for minimizing cycle times or optimize batch quality. The search capabilities of TrendMiner can be used to find and overlay the best batches or transitions. With the click of a button, you can fingerprint the golden behavior to use it for monitoring purposes. Multi-variate fingerprints can be used to track whether startups are happening according to the prescribed procedure. With the click of a button, you can fingerprint reference startup behavior to use it for monitoring purposes. Events that occur once will likely occur again somewhere in the future. With TrendMiner, it is easy to fingerprint these behaviors and set up alerts or label data when similar behaviors are detected in the future. The alerts help to monitor how often these events happen or even to prevent these events and control overall production performance. TrendMiner helps to prevent repeated production issues by guarding your live data like a watchdog. The software monitors your processes 24/7 and sends you automatic notifications when patterns of interest are detected. We support various notification mechanisms, including an embedded inbox and email alerts. Notifications can also be visualized for control room staff. TrendMiner’s fast access to historical data allows to “live” monitor current process behavior. Live monitoring does not require the user to keep looking at the screen, monitoring can be done as a background process. With TrendMiner, events can be captured and labelled automatically, based on monitoring alerts for saved search patterns, fingerprints or rules. This way, your knowledge base is continuously being enriched, and results from previous analysis can be leveraged for reporting and future diagnostics purposes. Furthermore, novice users can learn from others’ past process experience. Production losses or periods of high energy consumption can be detected with use of TrendMiner and listed automatically. Alerts can be set up to detect production losses and systematically analyze them for starting a continuous improvement cycle. Besides fingerprints, scatterplot based “best operating zones” can be created with TrendMiner. By controlling the process the asset can perform within its best operating zone helping to reduce unnecessary equipment stress, increasing asset reliability and extending its lifetime. The more TrendMiner is used and annotations are created with use of fingerprints and event frames, the more knowledge is captured and actively provided to stakeholders in the organization. Lessons from specific process behavior or improvements made in field settings can be actively monitored and assessed. Based on the findings, new automated notifications help to validate the changes and allow others in the organization to understand the changes. Traditionally, predictive analytics is about defining a scope, collecting data, developing and testing a data model, validating the outcomes and deploying the predictive model to the organization. With TrendMiner almost all these steps can be skipped. Our software is designed for self-service, giving subject matter experts instant access to predictive analytics insights, without help from a data scientist. Our interactive and model-free predictive mode is based on patent-pending technology and works in a fundamentally different way than classical model-based predictive technologies. The software calculates possible trajectories of the process and predicts future evolutions of key variables and process behaviors before they happen. By combining the various key capabilities of TrendMiner with defined rules, annotations can be logged in advanced situations. Specific spikes in process behavior can be ruled out for logging the annotations, or included as needed if the situation occurs longer than a specified period. Based on so called “if-then-else” rules, specific annotations can be logged. All the logging can take place automatically in the background and assessed whenever needed. With TrendMiner, users are presented with early indicators for anomalies of interest. These indicators are easily converted into early warnings. In this way, the process can be proactively adjusted to avoid waste and ensure product quality. Warnings messages can include instructions about what to do given the situation predicted. In this way, the process can be proactively adjusted to avoid waste and ensure product quality. TrendMiner supports creating and deploying soft sensors using an interactive and step-by-step approach with access to all process data to help your process experts to build better predictors. Our approach eliminates the need for a data scientist in the loop and reduces the lengthy process of modeling and deployment. Overall Equipment Effectiveness (OEE) depends on the process in which the asset operates. With TrendMiner, all tags related to the asset and the process in which it functions in can be used to analyze its performance. We call this the “contextualization of asset performance with process data”. By contextualizing asset performance with process data in this way, data-based predictive maintenance becomes possible. A common example is the fouling of heat exchangers. The process performance directly impacts the fouling and with use of TrendMiner you can predict when cleaning is needed. This can then be scheduled according to production planning to prevent reduced performance. TrendMiner predictive analytics help operators by informing them before the event occurs. This gives the operators enough time to take corrective action in advance. The operators can also respond to each situation more quickly using the knowledge that has been captured in TrendMiner. This helps them to control production levels and quality, avoid costly shutdowns and reduce safety risks in a timely manner. TrendMiner supports single node architectures ranging from a couple of thousands of tags to scale-out architectures for 50M tags or more. It can be used to support single sites up to globally operating business units with consolidation of dispersed historians, helping to optimize fleet performance. We connect out of the box to a range of existing enterprise data infrastructures, including OSIsoft, Aspen, GE, Yokogawa, Honeywell and Wonderware historians. There is no need to copy the data from your historian. TrendMiner leaves your master data in your existing data infrastructure, while adding advanced analytics capabilities. You might have a heterogeneous data landscape as a result of mergers and acquisitions, resulting in using historians of multiple vendors. TrendMiner supports multiple historians and supports analytics on data residing in the various historians in use in your organization. TrendMiner supports deployment on premises, in a customer management cloud environment (eg. Azure) or as a full SaaS solution. Once the TrendMiner application is connected to your historian server(s), process engineers and operators can start using the product. TrendMiner is a plug & play solution that fits seamlessly into your current IT landscape. We integrate with your current Active Directory setup and TrendMiner supports SAML compatible authentication providers for Single Sign On. TrendMiner is not an endpoint but a building block in your analytics landscape. Our APIs enable you to integrate programmatically, for instance to synchronize your shift logbook context data or develop a Business Intelligence dashboard on top of TrendMiner with your standard BI solution. TrendMiner offers connections with various systems and applications to leverage external data sources for analytics. TrendMiner also provides ways to feed external systems and applications with the analytics results from TrendMiner. The core connection is with process data historians, but for extended use of industrial self-service analytics, TrendMiner also connects with line of business applications such as enterprise asset management systems, BI tools for dashboards or data scientist workbench tools for extended use cases. In this way, TrendMiner forms a central data analytics platform between the historians, generic big data tools and business intelligence systems. Would you prefer to read more key capabilities offline?